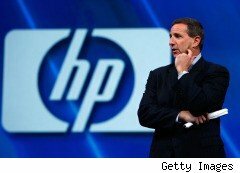 Why Did Mark Hurd, HP's Disgraced Ex-CEO, Get $37 Million Payoff? When Mark Hurd resigned as chief executive of Hewlett-Packard Co. (HPQ) last week, he got something few workers receive when they quit their jobs: a big payoff. Now, some corporate governance experts wonder if he was really entitled to that fat golden handshake. Hurd resigned Friday in a scandal that began when a former actress and outside marketing consultant named Jodie Fisher accused him of sexual harassment. While HP said an investigation showed that Hurd hadn't violated the company's harassment policies, it did reveal that Hurd had submitted inaccurate expense reports. The sum involved was reported to be around $20,000. According to a regulatory filing known as a Form 8K, Hurd will receive $12.2 million in cash under HP's severance plan, vested options on 775,000 shares of HP stock, and another 345,000 shares earned as a performance bonus. Compensation experts said at Monday's market price of around $41 a share, Hurd stands to gain $25 million from the stock. That has made a lot of people angry. "No matter how you put lipstick on the pig, Hurd was fired and there is no question he was fired for cause," says Jon Holman, president of a San Francisco recruiting firm, the Holman Group. "HP's agreement with Hurd says that when you are fired for cause, you don't get all that stuff. It's outrageous – why did he deserve it?" While Hurd was allowed to resign rather than actually being fired, Holman says existing policy at HP was vague enough to include an expense account offense in the definition of cause for dismissal. The company's policy encompasses "conduct, including action or failure to act, that is not in the best interest of or is injurious to HP." If he had been fired for cause, Hurd would have had to forfeit his severance pay and stock given for performance, but would have been allowed to keep the stock options that he already owned. But the separation agreement also gives him a month to exercise his options, a privilege rarely extended to terminated executives. Paul Hodgson, a compensation expert at the Corporate Library, a corporate governance and research firm, says CEOs are rarely forced to give up their severance pay when they leave companies, even when the circumstances are under a cloud. In contrast, most workers don't get severance pay when they quit. "Severance payments are supposed to act like unemployment benefits and tide us over until our next job," Hodgson says. "They're not supposed to be a pot of gold at the end of the rainbow. Regular workers don't get to the end of the rainbow, whereas CEOs just seem to start at the top and slide down to the other side." Jason Adwin, a compensation expert at Sibson Consulting, a human resources consultancy, says it is very rare for a chief executive to be forced out over an expense account offense. "Typically, the executives are at a compensation level and an overall organization level that the dollars we're talking about are rounding errors," Adwin says. "More important here was the messaging across the organization." By that, Adwin means the board of HP faced a delicate situation with Hurd's departure. He became CEO in April, 2005, after the ouster of chief executive Carly Fiorina, who had raised hackles by merging the company with Compaq Computer and firing many old hands at HP. The following year, HP's chairwoman, Patricia Dunn, left the company in a wiretapping scandal. When HP reached a civil settlement with the California's attorney general in the wiretapping case, Hurd proclaimed he was "committed to ensuring that HP regains its standing as a global leader in corporate ethics and responsibility." Holman says he believes it was the possibility of a drawn out lawsuit with Hurd, reopening all the wounds of the Fiorina and Dunn cases, eventually persuaded HP's board to allow Hurd to resign and receive all of his benefits. Adwin makes another key point about HP: The firm apparently had no succession plan in place, and it is now scrambling to find a replacement after Cathie Lesjak, the company's chief financial officer who was named interim chief executive, said she didn't want the job permanently. "If HP had a clear, unequivocal succession plan in place and had communicated that to Wall Street, perhaps they wouldn't have seen the type of decline they had in their share price," Adwin says, referring to a 9% plunge in HP's stock market value on Monday. The board needs to have a clear understanding if any one of the termination scenarios arise about what their course of action is going to be so they can act quickly and stay true to their principles."